Exceptional beauty results when an 1 1/2 old European-Cut diamond is mounted in a flattering white and yellow gold filigree setting. This large old European Cut diamond wedding ring has a diamond that measures approximately 1.47 carat weight and is I in color. This openwork white gold filigree setting illuminates the true beauty of this diamond. A finely engraved design enriches this feminine flowing ribbon filigree mounting. Made in 14kt (585) gold. 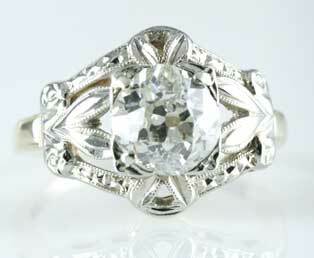 One old European-cut diamond appx 1.47 carat weight, Clarity: SI2, Color: I. This diamond is slightly asymmetrical.